Formative assessment is core to Personalized Learning. To master formative assessment as a pathway to personalizing the learning path, we need to make a critical mindset shift around assessment. Instead of thinking as assessment as the endpoint of the linear learning sequence, we need to think of assessment AS learning. By reimagining assessment as the spark of new learning, and specifically target self-assessment as that spark, we gain ground on helping students to become generative learners. The focus on blended learning models creates a rigor risk if activities are not standards aligned and measured. It’s quite possible to set up the perfectly timed and sequenced Station Rotation model with high student engagement while also missing the mark on personalization. Yes, blended learning is an efficient means to personalization but offline and digital activities must remain integritous to curricular standards. Further, it is critical for formative and summative assessments to demonstrate mastery of standards. 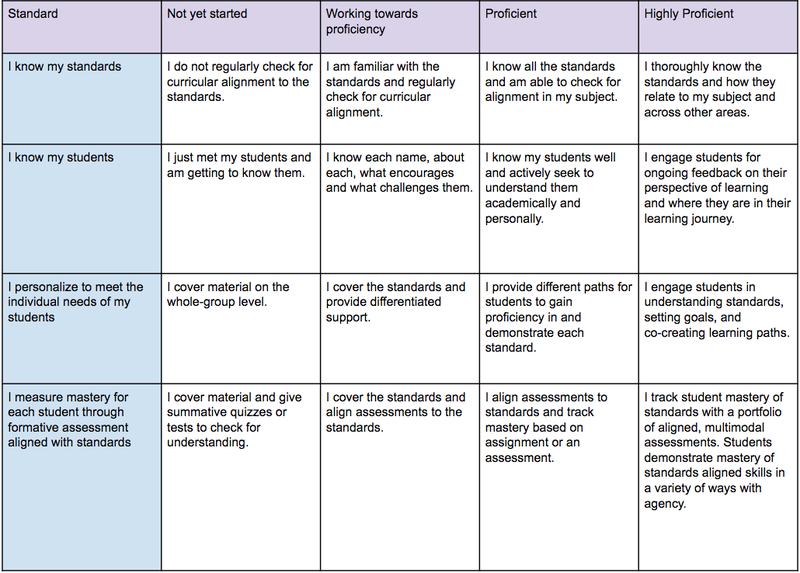 The use of rubrics and standards-aligned student learning logs can provide the essential skills backbone which allows for the flexibility of choice and agency in personalized learning. See our post on Lesson Planning for Personalization for a standards-based lesson template and challenge. Student empowerment through agency is the ultimate goal in personalized learning. As students become more active drivers, they learn to communicate about their learning, set their own goals, and generate growth. Students can experience agency through conferencing, choice, creativity, and assessment. Self-assessment and reflection is also a way to help teachers efficiently manage a personalized learning environment. There is a time investment at the beginning which gets significantly easier as teachers develop systems of efficiency within their classes. At the heart of the personalized learning pitch is the power of technology, and this power can certainly be leveraged to help lighten the planning load as multiple paths open for students to learn different skills at different paces. However, the time needed to assess the data, align, and coach is an addition to the equation. By creating a few simple systems for self-assessment (personalized learning log, data reflection & goals sheet, conference form, rubrics), teachers can empower students as agents and collaborate with them in planning for personalization. 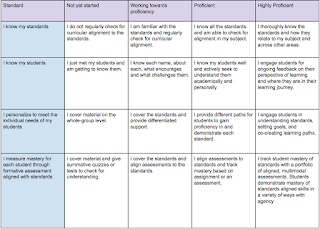 Click here to join the LINC PAACC Challenge by self-assessing where you are in the LINC Personalized Learning Self-Assessment Rubric pictured below and setting goals to earn a Level 1 and Level 2 LINC PAACC badge for personalization. I do not regularly check for curricular alignment to the standards. I am familiar with the standards and regularly check for curricular alignment. I know all the standards and am able to check for alignment in my subject. I thoroughly know the standards and how they relate to my subject and across other areas. I just met my students and am getting to know them. I know each name, about each, what encourages and what challenges them. I know my students well and actively seek to understand them academically and personally. I engage students for ongoing feedback on their perspective of learning and where they are in their learning journey. I cover material on the whole-group level. I cover the standards and provide differentiated support. I provide different paths for students to gain proficiency in and demonstrate each standard. I engage students in understanding standards, setting goals, and co-creating learning paths. I cover material and give summative quizzes or tests to check for understanding. I cover the standards and align assessments to the standards. I align assessments to standards and track mastery based on assignment or an assessment. I track student mastery of standards with a portfolio of aligned, multimodal assessments. Students demonstrate mastery of standards aligned skills in a variety of ways with agency. Students become more active when, they learn to communicate about their learning, set their own goals, and generate growth. There are many teachers empower there students as an agents and collaborate with them in planning for personalization. Thanks for sharing about Personalized Learning. Nice article. States a very good layout of learning python programming. birla vidhya niketan I am also planning to teach students to empower them.